Gjumrakch Aliev, founder of Gally International, joined the meeting on June 21st. New multi-targeting medications were talked about. Dr. Aliev said about his practice in the USA, “Currently 90% of medications are either placebos or even toxic. By influencing one organ we inevitably affect the others, and sometimes this effect is negative. However, many diseases possess similar qualities, and we can overbear them. For example, cell damage during cancer and brain damage during Parkinson’s or Alzheimer’s are in many ways similar. I think we can achieve tangible results in fighting those ailments”. Yury Shtyrlin, Head of Pharma 2020 Project, was the one who invited Dr. Aliev to visit. After witnessing the state of affairs at KFU the guest opined, “KFU is the best in Russia and one of the best in the world. You can believe me; I have seen many universities and labs”. 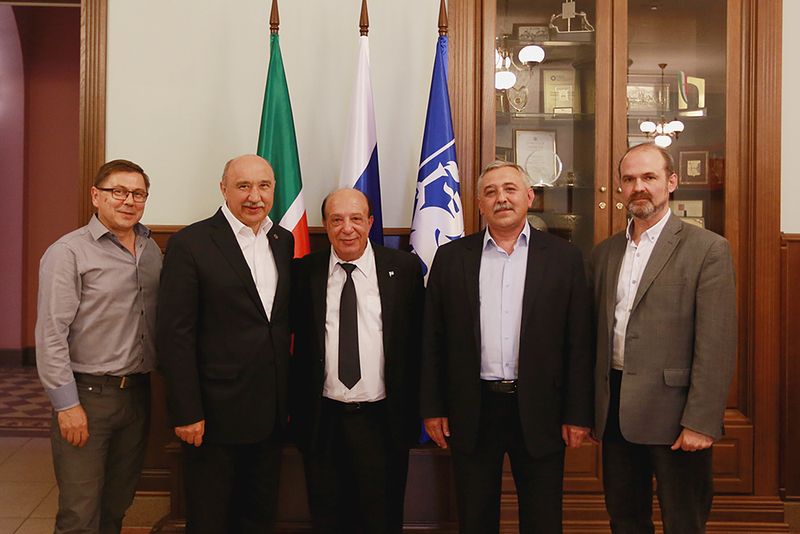 Rector Ilshat Gafurov supported the decision to apply for a megagrant together with Dr. Aliev. He emphasized that all the results will be the property of Kazan University and that invited researchers should give lectures to students here. The existing equipment will suffice for the proposed research work. The funds (should they be obtained) will be directed at establishing a multi-targeting pharmacology center.